George Washington University (GW) Vice President for Health Affairs and Dean of the School of Medicine and Health Sciences (SMHS) Jeffrey S. Akman, MD ’81, RESD ’85, announced Jan. 17, that he will step down from his roles as vice president and SMHS dean following eight years in the administrative positions. Akman, who also serves as the Walter A. Bloedorn Professor of Administrative Medicine, will remain in the roles until they can be filled by a successor, at which time he will return to the faculty. A search is anticipated to begin early this year. “For more than 40 years at the George Washington University, Jeff Akman has distinguished himself as a leader, a role model, and a tireless advocate for his students, faculty, and alumni. We are grateful for his service and leadership and that his contribution to the university will continue,” said GW President Thomas LeBlanc. Akman was named vice president for health affairs (VPHA) and dean in 2013 after serving as interim VPHA and dean since December 2010. Among his many accomplishments, Akman led the development and implementation of a transformational strategic plan for SMHS, helped guide the restructuring of the relationship between the university and the GW Medical Faculty Associates (MFA), and led the efforts to earn the Liaison Committee on Medical Education’s full accreditation in 2016 for an eight-year term. He worked closely with the leadership of GW Hospital to expand training opportunities with cutting-edge technology in health care and with the leadership of Children’s National Health System (Children’s National) to strengthen the academic partnership between the two institutions. As an alumnus and a teacher of thousands of GW medical and health sciences students and residents, Akman prioritized SMHS alumni outreach and engagement. Under Akman’s direction, the school made significant investments in student scholarships and faculty development, opened a new Clinical Learning and Simulation Skills (CLASS) Center; implemented major revisions to both the MD and Physician Assistant curriculums; integrated an innovative clinical public health curriculum to take advantage of GW’s unique location; expanded graduate, health sciences, and distance education programs; launched a PhD program in Translational Health Sciences; and transitioned to competency-based residency training with an expansion of education in quality and patient safety. Akman oversaw a significant expansion in research, including in cancer, neurosciences, HIV/AIDS, and microbiology; recruited nationally recognized physicians, health care professionals, and scientists; and expanded research opportunities for students. He led the creation of the GW Cancer Center; and, in collaboration with GW University Hospital and GW MFA leadership, oversaw the expansion of the clinical enterprise including in transplantation, cardiovascular, neurosciences, and trauma and critical care. Community and urban health has been a lifetime passion for Akman. SMHS efforts in health education and outreach increased significantly with the goal of achieving health equity for residents in the District of Columbia and the surrounding region. Under his watch, international affiliations grew to more than 150, with new programs expanded to include global research partnerships and a broad range of educational and training opportunities for GW students and residents as well as for students and physicians from around the world. “With the successful completion of the school’s strategic plan, the historic restructuring of the GW and MFA relationship, and with a new president at the helm, it is the right time to hand the baton to the next leader of SMHS,” he said. 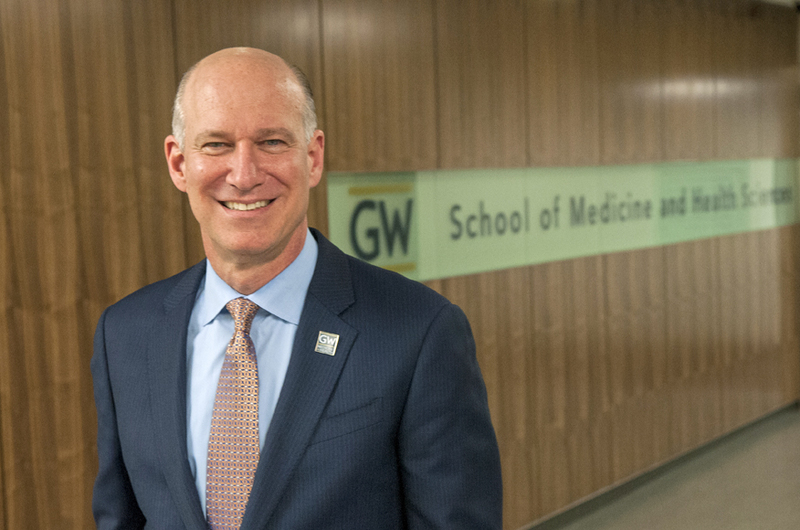 “As I reflect on my years as VPHA and dean, and the more than 40 years since I entered GW as a medical student, I am truly amazed by the remarkable progress we have made as an institution. I am particularly proud that during my tenure as VPHA and dean my family and I created the Akman Endowed Professorship in Global Psychiatry, two endowed Akman medical student scholarship funds, and the Akman endowed fellowship in psychiatry. “With deep gratitude to my outstanding leadership team, our incredibly dedicated faculty and staff, and our academic and clinical partners, it has been the most rewarding journey one could ever imagine and, as a grateful alumnus, I am excited to see our progress continue under the leadership of President LeBlanc and the next dean of SMHS. To the awesome SMHS students, residents, and fellows who inspire me every day, Raise High!” Akman said. Akman completed his psychiatry residency at GW in 1985, having served as chief resident. He then joined the SMHS psychiatry faculty where he served as director of medical student education in psychiatry and developed a national reputation in the field of HIV/AIDS psychiatry and LGBTQ mental health. Between 1991 and 2000, Akman served as the SMHS assistant dean for student educational policies and then as associate dean for student and faculty development and policies. He was appointed as the Leon M. Yochelson Professor and Chair of the GW Department of Psychiatry and Behavioral Sciences in 2000. In October 2013, Akman was installed as the Walter A. Bloedorn Professor of Administrative Medicine, an endowed professorship named in honor of the former director of GW Hospital, and dean of the school of medicine from 1939–57. Akman is the recipient of numerous honors and awards, including the GW Distinguished Alumni Service Award. He is a member of Alpha Omega Alpha medical honor society, an elected member of the American College of Psychiatrists, and a Distinguished Life Member of the American Psychiatric Association. He serves on the National Academy of Medicine’s Action Collaborative on Countering the U.S. Opioid Epidemic and served on President Barack Obama's Advisory Council on HIV/AIDS.